Below are a few selections from Our Lady’s messages received by Kenneth Staloch between 1990 and 1992 regarding the Missionary Image of Our Lady of Guadalupe. From these excerpted messages, we can clearly see what purpose Our Lady is seeking in launching the plan of her Missionary Image and how essential our helping her is for the successful accomplishment of her plan. Our Lady’s messages explain her purpose as ending all abortions in the world and bringing not just those in the Americas but her children in the whole world to her Son Jesus through her Immaculate Heart. At the same time, she confirms that her children of the Americas have a special place in her plans, which may mean that the current problems (the most striking ones being the spiritual and moral diseases) are particularly serious in the United States and other countries in the Americas and/or that those populations in the United States and other countries in the Americas have the responsibility to be good models and evangelists to all others in the world, or it may mean both. In any case, as Our Lady already launched her plan of The Missionary Image of Our Lady of Guadalupe starting in the United States, we are being called to participate in the work of Our Lady to accomplish her Mission given by God. The mission that Our Lady received is something that is impossible for any humans to successfully accomplish. Our Lady alone can achieve it, because, when God gave this Mission to Our Lady, He also equipped her with sufficient power to defeat Satan and restore the true faith, peace, and harmony in the world. It seems so appropriate that God gave to a woman (Our Lady) the task of overcoming Satan and restoring the right order in the world, as Satan had used a woman (Eve) to destroy the right order among humans by tempting her with lies. Thus, Our Lady’s plan of her Missionary Image is the historic launching of her efforts to overcome Satan and open a new age truly reigned by Our Lord. Our task at this critical time is to prepare ourselves with fervent prayers and diligent studies of the authentic Church teachings: both the Catechism of the Catholic Church and the examples of the Saints so that we can help Our Lady in fruitful ways. Many of the Saints have prophesied that it is already too late to stop the worldwide Chastisement because of the enormous accumulation of human sins in the world and because some of the people will never repent their sins. But the door of saving more persons and reducing the severity and length of the Chastisement is still left open to us. Nobody needs to prematurely despair, because Our Lady will help whoever opens his/her heart, repent their sins, and reform their lives. Truly, Our Lady is the hope of the future of America and the world. However, the time allowed to us is limited and must be used well. In the sixth period of the Church will begin the powerful Monarch and the Holy Pontiff, as mentioned previously, and it will last until the revelation of Antichrist. In this period, God will console His Holy Church for the affliction and great tribulation which she has endured during the fifth period. All nations will become Catholic. Vocations will be abundant as never before, and all men will seek only the Kingdom of God and His justice. Men will live in peace, and this will be granted because people will make their peace with God. They will live under the protection of the Great Monarch and his successors. THE CATHOLIC KNIGHT: As Christian Americans we are naturally obsessed with the prophetic future of our nation. Evangelicals search feverishly for some allegorical reference to the United States in Sacred Scripture. Catholics seek references to America in private revelation. An entire devotion has arisen during the 20th century, called Our Lady of America, in which the Blessed Virgin Mary is said to have relayed specific warnings and guidance to our fledgling nation. Yes, that's right, I said 'fledgling' nation, because you see, the United States is not a very old nation at all. It's rather young actually, less than 240 years old, and our government is built entirely on a proposition more than any culture or national identity. This makes America very structurally weak, relying entirely on the force of the federal government to hold it together. What Americans often forget however, is that our federal republic is a creation of circumstance and nothing more. When we talk about culture, we have to ask ourselves what culture is. 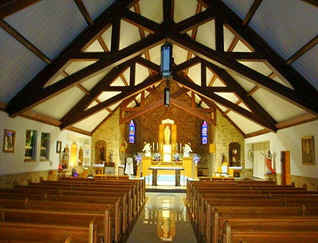 The word 'culture' comes from the Latin word cultus meaning religion. Culture is in fact nothing more then the way a religion interacts with a people and their environment. America, for the most part is a culture based on the indigenous Christian cultures of the British Isles -- English, Scottish and Irish. There is a smattering of other cultures as well, that have left their impression on the United States, but the dominant culture (the prevailing and established culture) is very British. Americans speak English. Our legal system is based on English Common Law. Our traditional music and dance are based on Celtic folk culture -- Irish and Scottish. Even the large black population in the United States is heavily influenced by this, as they have virtually nothing in common with African culture and haven't in centuries. This is who we are, and there is no mistaking that. We are all Americans, and that means we are all culturally British, or at least some variant of that. What makes matters confusing is the modern phenomenon of multiculturalism and the historical reality of Yankee imperialism. We could argue America's empire actually began just before the American Civil War (1861-1865), in what we know as the Mexican-American War (1846-1848). This resulted in the large annexation of previously held Mexican territories, as well as their people and culture. Having once been a resident of Southern California, I can attest to the heavy Spanish-Mexican influence on this region to this very day. Thus, in the Southwest corner of the United States, there exists a very Spanish-Mexican culture, punctuated by enclaves of other cultures that have immigrated from all over the world. In this region of the United States, it seems that the English language is optional, and as a result of this (as well as massive immigration from Mexico in recent years), much of the businesses and local governments in the United States have essentially become bilingual (English and Spanish). I bring this up because to understand America's future, we must understand America's history. The United States of America is a proposition nation, made up entirely of a propositional republican form of government that was heavily based on a culture of British imperialism. The creation of the United States of America is the result of a secession from the British empire, followed by a political imitation of that same empire. The American hegemony is very British, very Protestant and very imperialistic. It is also an aberration. For had it not been for the abuses of King George III, the original thirteen colonies that started the United States might have never seceded from the British Empire. Had this secession from the crown never happened, it is likely the United States would exist much in the same way Canada does today. In fact, I dare say, the United States of America would exist today as part of the British Commonwealth, and her borders would stop at the Mississippi River, (France having sold the Louisiana Purchase to Spain instead), while Canada would occupy most of the American Northwest, and Mexico would likely occupy much of the American Midwest and Southwest. This is just speculation to be sure, but the point of such historical speculation is to further understand what America is. Had it not been for the British-Protestant-Imperialist heritage of the United States, coupled with the unrestrained nature of republican politics, it would not exist today as we know it. Above I briefly mentioned the devotion to Our Lady of America. This was canonically approved in 1963 by the Archbishop of Cincinnati, the late Paul Francis Leibold. Because of some concern over this, the canonical approval was reviewed by canon lawyer Archbishop (now Cardinal) Raymond Burke in 2007. (Cardinal Burke is now Prefect of the Apostolic Signatura at the Vatican.) Cardinal Burke's letter of canonical review can be read here. Cardinal Burke determined that Archbishop Leibold did indeed canonically approve the apparition and message according to the canonical norms of the Catholic Church, and that because of this, Catholics are free to practice what he described as this 'beautiful devotion.' The message of Our Lady of America is long, but essentially simple in nature. Basically, it involves a commitment to the indwelling presence of the Holy Trinity within the hearts of every Christian, and an absolute commitment to chastity and spiritual purity. We are told in this message that this is God's will for the people of the United States, to lead the world in chastity and spiritual purity, and that failure to embrace God's will on this will only result in our national misery. There are three particular apparitions and messages that I believe directly relate to the future of the United States of America. 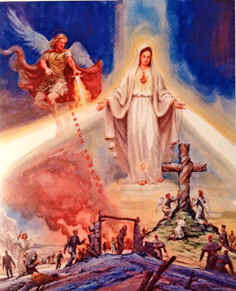 These three are the apparitions at Fatima, Akita and Champion. While the political fate of the United States is not revealed to us, I think it is safe to assume, based on the global nature of two of these apparitions, confirmed by the local nature of one, that the United States will not remain intact as the political entity we know today. The very thought of such a radical geopolitical paradigm-shift is shocking to most of us today, but in light of America's refusal to follow God's plan for us, should it be surprising? We must remember WHY we are an independent nation to begin with. Why was that? Ah yes, American colonists sought independence from a despotic and tyrannical King George III -- a Protestant emperor! God in his mercy granted that independence, and he tolerated the Protestant imperialism of their American descendants. However, when he revealed his plan for us as a nation in 1963, we immediately rejected it outright, and it was within just one decade that America began its downward spiral into irrelevancy. There is no indication of any national repentance in sight. Only a remnant of faithful Catholics (and a few Protestants of good will) remain for the worldwide Chastisement that is to come. A few things should be pointed out here. 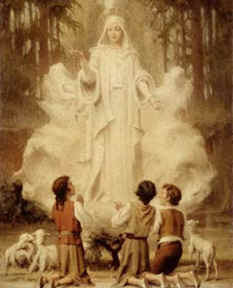 Our Lady of Fatima wanted to establish a world devotion to the Immaculate Heart of Mary. The United States of America was dedicated to the Immaculate Conception by the Catholic bishops at the First Council of Baltimore back in 1846. The National Shrine of the Immaculate Conception was built in honor of this patronage, in Washington DC, during the time of Sister Mary Ephrem's visitations by Our Lady of America. This apparition of Mary requested that a statue of her as "Our Lady of America" be placed in the National Shrine of the Immaculate Conception by the bishops in solemn procession as a sign that America had accepted God's plan of chastity and spiritual purity. The statue was never placed there, and remains at the Blessed John Paul II Cultural Centre in Washington DC, just blocks away from the National Shrine. It is placed in an ideal location for a future procession, however, it looks as if the Chastisement of America will have to come first. Regarding the requested Fatima consecration of Russia to the Immaculate Heart of Mary, that did not happen in a timely manner. Sister Lucia plainly stated that the consecration came too late, and did not follow the full instructions of Our Lady of Fatima. So while the effects of the coming Chastisement will be mitigated because of it, they will not be prevented. Russia did indeed spread its errors around the world, as prophesied, and persecuted the Church most severely. Of the many errors Russia spread, one of the most damning was sexual liberation, which was carried to America by Soviet moles in the media and universities. The objective was to weaken America's moral foundation and thus prepare it for an eventual communist takeover. (See the writings of Friedrich Engels for details of this strategy.) Rather than embrace the message of Our Lady of America, we Americans (mostly Protestants and cultural Catholics) chose the message of Soviet moles instead, fully and wholeheartedly embracing sexual immorality as our new national norm, in what came to be called the 'sexual revolution.' Our Lady of Fatima went on to describe what would come of this.. . When the Vatican unveiled the third secret, Cardinal Joseph Ratzinger, the current Pope Benedict XVI, explained that the language of the third secret was apocalyptic in nature, and as a result should be interpreted in a highly symbolic manner. The image painted is symbolically a world destroyed by the errors of communism, both directly and indirectly, the faith of millions left in ruin, and the torturous persecutions of the Church reaching even as high as the pope himself. Pope John Paul II suffered two assassination attempts, one of them (the most famous and public one), was prompted by the Soviet KGB. Who knows what future persecutions await the Church, and what further sufferings await the pope. Students of private revelation have an idea. Something interesting about the solar phenomenon surrounding Our Lady of Fatima. As reported by some 70,000 people present at the event in 1917; the sun appeared to dance and twirl in the sky, taking on all shapes and colors, then it plunged to earth, terrifying all who witnessed it, leaving their rain-soaked clothing and ground dry, before returning to its natural state in the sky. Pope Paul VI believed this miraculous event was a forewarning of some terrible future Chastisement involving fire from the sky that would cleanse the earth and leave it 'dry' for the persecuted Church to begin her work of preaching the gospel again. It is here Our Lady of Fatima retires her message, and picks it up again as Our Lady of Akita in Japan in 1973. Again, like in the Third Secret of Fatima, we see the coming of flames. Our Lady of Fatima revealed a miracle of God, in which the earth was nearly scorched by the sun witnessed by tens of thousands of people. In a vision she revealed to the three children: "an Angel with a flaming sword in his left hand; flashing, it gave out flames that looked as though they would set the world on fire; but they died out in contact with the splendor that Our Lady radiated towards him from her right hand." At Akita, our Lady again warned: "Fire will fall from the sky and will wipe out a great part of humanity, the good as well as the bad, sparing neither priests nor faithful. The survivors will find themselves so desolate that they will envy the dead. The only arms which will remain for you will be the Rosary and the Sign left by My Son." So here we see the future of our fallen world, which awaits us in terror, the transition from our present world into the world that the Venerable Holzhauser foresaw, the exit of the 'fifth period' of the Church and the dawn of the 'sixth period.' It shall be inaugurated by fire from the sky. Where, however, is America's place in all of this? What becomes of the United States? Surely something special awaits the last remaining superpower of the world? As they approached the hallowed spot, Adele could see the beautiful lady, clothed in dazzling white, with a yellow sash around her waist. Her dress fell to her feet in graceful folds. She had a crown of stars around her head, and her long, golden, wavy hair fell loosely around her shoulders. Such a heavenly light shone around her that Adele could hardly look back at her sweet face. Overcome by this heavenly light and the beauty of her amiable visitor, Adele fell on her knees. 'Adele, who is it?'' said one of the women. 'O why can't we see her as you do?' said another weeping. ‘What more can I do, dear Lady?’ said Adele, weeping. 'Gather the children in this wild country and teach them what they should know for salvation’ ‘Teach them, their catechism, how to sign themselves with the sign of the Cross, and how to approach the sacraments; that is what I wish you to do. Go and fear nothing. I will help you.’ "
The manifestation of Our Lady then lifted her hands, as though beseeching a blessing for those at her feet, and slowly vanished, leaving Adele overwhelmed and prostrate on the ground. 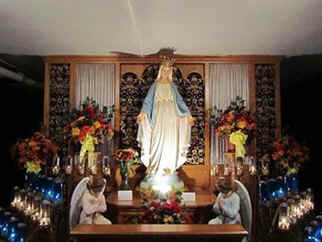 shrine, but rather than panic in fear they turned toward Our Lady and prayed. The fire engulfed everything in all directions, singeing the fence around the shrine on all sides, but the shrine, the small plot of land it stood and everyone inside were left untouched. It is a foreshadowing of what is to come upon the people of the United States of America. The same can be said of Canada, Australia, Russia, China, Europe and the whole world. The great and mighty superpower of the United States of America will be thrown in with the lot of every nation, no more special than they, to endure the same Chastisement that is to come. What awaits America? Fire! Not just any fire, but fire from heaven, in some kind of cataclysmic worldwide disaster that will destroy the majority of the inhabitants of the planet, and leave a world behind that is ruled by Catholic kings, a Great Monarch and a holy pope. It will be the last great era of peace, the sixth age of the Church, before the rise of Antichrist and the end of history. What then is the moral to this story for Catholics in the United States? Simple. We have only two jobs. 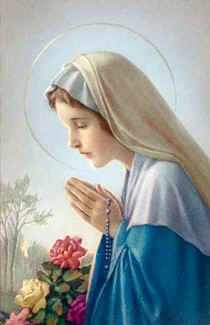 First, turn to Our Lady and Lord through the Holy Rosary and the Holy Eucharist. Second, evangelize, Evangelize, EVANGELIZE!!! As our Lady told Sister Adele: 'Gather the children in this wild country and teach them what they should know for salvation. Teach them their catechism, how to sign themselves with the sign of the Cross, and how to approach the sacraments; that is what I wish you to do. Go and fear nothing. I will help you.’ This is our only hope against the heavenly fire that is to come, for if we do this, we will save ourselves by relying on the protection of Jesus through Mary. As it becomes painfully clear that the political influence of the Catholic Church is coming to an end, and the lofty goal of 'Social Justice' appears further and further out of reach, we have nothing left to do but return to our first mission and transform our neighborhoods one conversion at a time.